Smart Compliance Food Service Kit w/Meds, Large Plastic Cabinet. 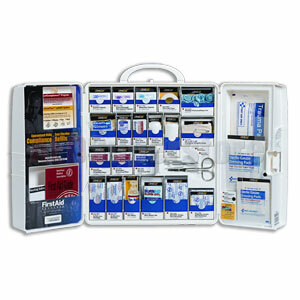 This food service kit is ideal for restaurants, delis, or any food service establishment. The swing-out door and easy-to-carry handle add extra convenience. This unique cabinet design eliminates disorganized and missing supplies. Clearly labeled compartments create a cabinet that is easy to use and restock. With the expansion pocket, you can customize your cabinet to meet your specific needs. 16" x 14" x 5.